We were delighted to be asked by Chester Voluntary Action to be involved in their first podcast ‘Disability Focus’ where they were concentrating on the issue of the Stay Up Late campaign. We love being involved in things like this and also are always excited to hear how people are campaigning in their local areas. However, it’s also tinged with a sense of total frustration at hearing the stories which you’ll hear in the podcast. People being tricked in to thinking the night is over by their ‘ever so clever’ carer. These issues, as we know, aren’t peculiar to the Cheshire area – and we’ve heard stories like this for years. One that sticks out is the heart breaking story of a performer being taken home before he had the opportunity to perform the dance piece he’d been working on for months, or the musician who was taken off the stage mid performance by their support worker. It’s actually hard to find words to describe the levels of disrespect this shows for people without coming over all sweary! Sometimes these support workers think they’re more than what they actually are and they think they rule you instead of you rule them. Too right Ian, it might well be a big part of their lives, I know going out and spending time with my mates is a big part of my life and something I look forward to. It just seems that there’s a culture where support staff don’t take any time to consider the impact of their actions on the people they support, the impact on their self-esteem and also mental health. Presenter – …what would be your ideal time to come home at? Michael – On a Friday half past twelve, what’s wrong with that? We’ve been banging on about this for ages (as you know) and sometimes it can feel overwhelming to know where to start with all the deprivation of rights for people with learning disabilities to just have a social life but we’ve got a plan forming in our heads! It also brought to mind this blogpost we wrote in 2015 – ‘The 6 Types of Support Worker’ which actually upset a few people, maybe the recognised they weren’t our ideal ‘Type 5’! 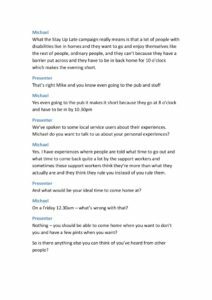 If we ask the service users “would they like to go to [an event]?” the first thing that will come out of their mouth is “I’ll have to ask me staff”. Why should they have to ask their staff? If they want to go their staff should be finding ways to make them go to make it happen for them to give them the chances. We’ve said this before “We’ve got a plan” and we’re also not even quite sure how we’re going to fund this plan yet but we’re going to make it happen one way or another. This plan is to have a series of one-day events which you could call a conference but they’re going to be a practical day of creating a co-produced plan to make some action happen. We’ll be inviting people with learning disabilities, advocates, support workers, managers and commissioners and we will focus on making something happen. So watch this space – something is going to happen! Thank you to ChesterVoluntary Action for recording this podcast and we’re looking forward to hearing more.